Have you ever wondered what it takes to be an astronaut? Want to know what the inside of a space shuttle looks like? Want to touch a real piece of the Moon? Experience all these one-of-a-kind opportunities and more at Space Center Houston! Whether you’re coordinating a school field trip or a family vacation, National Charter Bus can streamline your transportation to the center, around Houston, and beyond. We specialize in customizing your travel solutions, from the size of the bus down to amenities that make your trip that much more easy and memorable, all at a predictable price point. 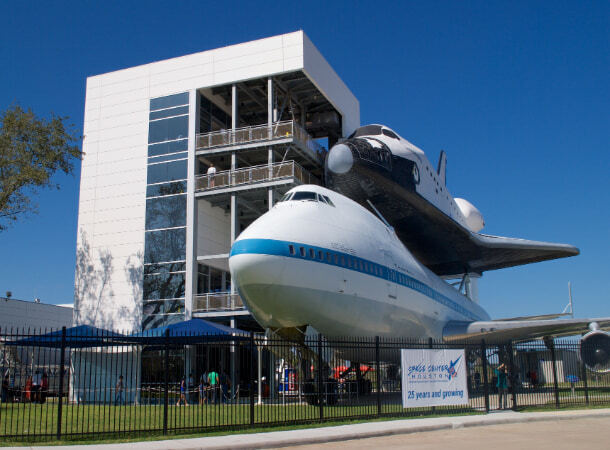 Call 713-234-6591 today, and a reservation specialist will be happy to assemble the perfect fleet for your group’s travels to Space Center Houston. Known around the world as the home of NASA Mission Control, International Space Station Mission Control, and astronaut training, Space Center Houston provides an exclusive look behind the scenes of NASA Johnson Space Center. As Houston’s first Smithsonian Affiliate museum, it serves as the Official Visitor Center for the JSC and is funded by the Manned Space Flight Education Foundation, Inc., a non-profit organization dedicated to space science education. Before their transformation into the open exhibits they are today, many of the Space Center’s 400 artifacts and models were displayed in the JSC employee auditorium hallways, away from the public. Now, the extensive collection draws more than 1 million visitors every year to this world-class facility. The center aims to educate guests of all ages in the history of America’s human space-flight programs and inspire youth with the possibilities of future space travel. Located roughly 30 minutes from Houston city center, Space Center Houston can be a bit of a trek for out-of-town visitors. Especially if you’re traveling in a large group, navigating to and from the Space Center can be challenging. We recommend booking an 18-, 20-, or 25-passenger minibus to transport small- to medium-sized tour groups from your hotel to the center. Due to their compact size and roomy interior, the minibuses we charter are perfect for traversing the busy Houston streets in comfort. For large groups traveling long distances from cities like San Antonio, Austin, or Dallas, a charter bus may be the best fit for you. Whether you need a quick shuttle, a large fleet, or any combination of services, National Charter Bus can pair your group with the perfect rental plan. Passengers can even enjoy amenities like WiFi, power outlets, reclining seats, extra legroom, and much more, ensuring everyone stays refreshed and entertained on the road. When they arrive at Space Center Houston, visitors should note that there is a $5 parking fee per vehicle. Large groups can save money and time finding adequate parking for multiple cars by forgoing the carpool caravan and traveling by charter bus. The space center waives parking fees for buses, and you can arrange to have your group dropped off at the front entrance while your driver handles the parking. Leaving the transportation logistics to a professional grants your group more time to explore all that the center has to offer. Bus drivers can even obtain a complimentary ticket at the center’s Guest Services Desk and stay on-site, so you can rest assured they are nearby when everyone is ready to leave. Space Center Houston is open most days from 10am to 5pm and offers special programs for groups touring the center. Groups of at least 20 people can take advantage of discounted tickets, meal plans, guided tours, and more if they reserve tickets at least 7 days before their visit. 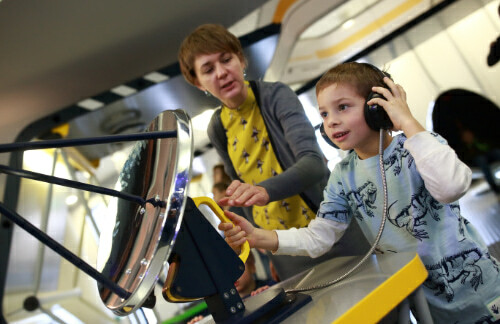 A Certified Autism Center, this interactive museum is dedicated to providing a comfortable education experience for everyone by offering accessibility programs, including low-stimulus, sensory-friendly events to deaf and hard-of-hearing resources. Check out the center’s accessibility guide for more information. This gallery is home to multiple spacecrafts that have breached the atmosphere. Here, visitors can trace the progression of human space exploration through a variety of national treasures, including the Apollo 17 Command Module, a full-size Skylab Training module, and a moon rock you can touch. This exhibit showcases spacesuits worn by real astronauts! Come see the world’s most comprehensive collection of astronaut apparel, from flight suits used in training to suits worn on lunar spacewalks. Have you ever wanted to walk around inside a space shuttle? Now’s your chance! In this area, visitors can enter an exact replica of the historical Independence shuttle, mounted on top of the original NASA 905 shuttle carrier aircraft. This interactive gallery grants visitors a peek into the NASA exploration efforts on Mars. 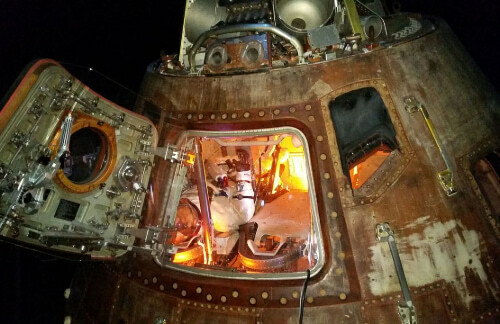 Experience what a day on Mars looks and feels like, climb into a simulated Orion capsule to learn what it takes to get there, and touch a real piece of a Martian meteorite. 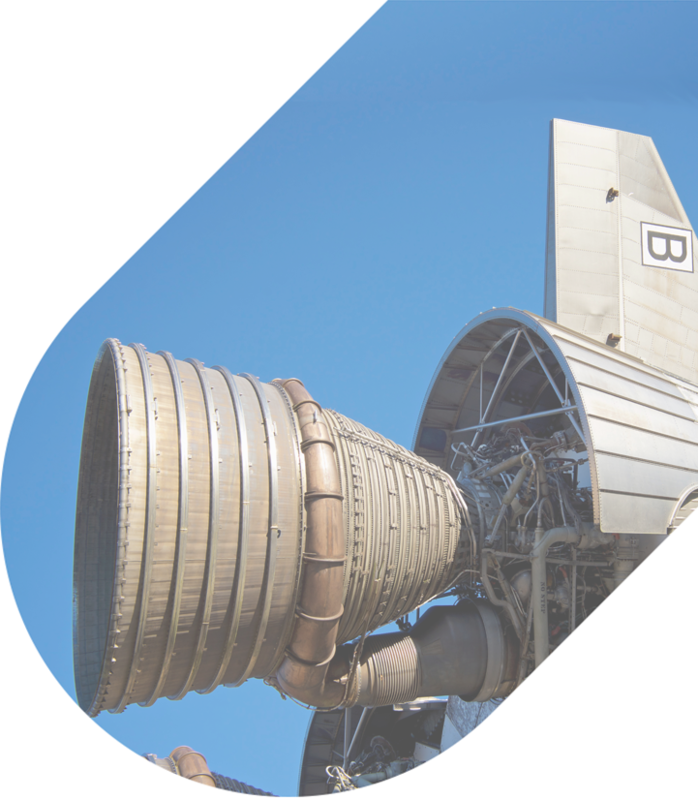 Get an on-site, behind-the-scenes tour of NASA Johnson Space Center! This tour guides guests past the actual Saturn V rockets in Rocket Park, around a currently-used astronaut training facility, and through the iconic Christopher C. Kraft Mission Control room. Venture to this auditorium for live presentations about what NASA has planned for the future of deep space exploration, real-time updates on current missions, and special events happening in space and on Earth. This interactive gallery offers a glimpse into the International Space Station, from artifacts that have been used in orbit to a live presentation that portrays what it’s like to live aboard the station. The space center offers many activities and events that are perfect for school field trips. Young scientists are invited to engage in the center’s variety of programs, from specialty explorer camps for guests of all ages to overnight events that allow students to camp beneath the wing of a historic Shuttle Carrier Aircraft. Ensure your little space explorers’ safety with a private transportation rental from National Charter Bus. We specialize in providing efficient and comfortable travel experiences you can’t find on a traditional school bus. Request a bus with an on-board restroom to cut down the number of pit stops you make on your way to the space center. With amenities like televisions with DVD players to keep your passengers entertained along the ride and plenty of compartments to store their personal belongings, a full-sized motorcoach is the best transportation option for school groups on the go. When you select a bus from any of the options in our potential fleet, you can expect a state-of-the-art vehicle with all the latest safety features. We only enlist drivers who have passed a series of background checks, performance exams, and drug tests before they get behind the wheel, so you can trust these professionals to deliver your children, tweens, and teens safely and on-time. What are you waiting for? Call 713-234-6591 today to reserve your private transportation rental to Space Center Houston. Our team of travel experts can coordinate your transportation schedule and assemble the perfect fleet for your group’s size, agenda, and desired amenities. We’re available 24/7 to answer your transportation questions and offer a free, personalized quote with no obligation!